This Finnish-Russian mushroom salad or spread is absolutely delicious. When it was first introduced to me by fellow food blogger Anna, I couldn’t believe it was made from only a few ingredients (fried mushrooms, smetana, dill and salt). It truly is one of those dishes where the sum if far far greater than its parts. The fabulous recipe is courtesy or Swedish food writer Jens Linder and was published in one of the leading Swedish newspapers as a dish for Julbordet, i.e. the Christmas smorgasbord, but I prefer it like this, served on crostini as a pre-dinner snack, all year round. Please note the recipe calls for smetana; the Russian version of creme fraiche/soured cream. If you can’t find it creme fraiche is a good substitute, but smetana works so well here it’s worth going out of your way to find it. Personally, I will place an order for some here next time I get a craving. I also mixed fresh and dried mushrooms as I prefer the texture of the fresh ones but as it’s not mushroom season, they taste less than the dried porcini and black trumpets I have in my cupboard. Translated from and adapted after Jens Linder’s recipe. This salad is so delicious I would urge you to make a double batch straight away. That’s what I did, and it was the perfect amount for five hungry people as a pre-dinner snack. Soak the dried mushrooms in warm water for ten minutes. Drain and discard the liquid. If using fresh or frozen mushrooms, finely chop these. Fry the mushrooms in butter on medium heat until golden. Stir occasionally. Remove from the heat and leave to cool. Mix the now cool mushrooms with whole sea salt flakes, dill and smetana. The mixture should be plenty salty. Leave for a few hours in the fridge before serving. Divide between the crostini and serve. Dill works really well in hummus, I discovered this summer when I thought of trying it for a dinner party. It went down really well with my friends and especially with my best friend Emma who liked it so much she urged me to make it again a few days later when cooking at her house. Rinse the chickpeas and pour into a food processor bowl. Add 100 ml olive oil, 1 1/2 tbsp tahini, the garlic and the juice of 1/2 lemon. Mix for a good while until you have a smooth paste. Add salt and pepper and taste. Add more oil, tahini, lemon juice, salt and pepper – whatever you think is needed. Add the dill and mix again. Season to taste and adjust the flavours once more if needed. Place in fridge until serving. Keeps for 5 days in the fridge. Cut the pitta breads into smaller pieces using a pair of scissors. Place on a parchment lined baking tray and drizzle with olive oil. Add salt and pepper (and any other seasoning you might like) and place in 200C oven for approx 10 minutes (until golden and crispy). Serve immediately. I found a recipe for confit garlic in an issue of Bon Appetit and I liked the idea, but thought using butter as the recipe suggested seemed a bit risky so I did it my own way, with oil. It still amazes me how different garlic can taste depending on how it’s prepared. I love the sweetness from caramelised garlic and the punch of frying fresh chopped garlic with mushrooms for example. The confit garlic is somewhere in between the two; it’s less sweet than caramelised garlic but a lot softer in flavour than raw. I used the confit garlic to make garlic bread and it was, as I suspected, absolutely delicious! Why not try wild garlic bread or cheesy garlic bread next? Pre-heat the oven to 150C. Peel the garlic and place the cloves in a ramekin. Cover with oil. Place in the oven until the garlic is soft, approx 30 minutes. Leave to cool. Remove the garlic. Save the oil for roasting potatoes and vegetables in the oven. Keeps in the fridge. Remove the garlic from the oil and mush into the butter. Add parsley and mix well. Make slits in the bread and spread with the butter. Wrap in tin foil and bake for 10 minutes in 180C until the butter has melted. Place the remaining butter on a sheet of cling. Shape into a roll and place in the fridge or freezer. Use for garlic breads or as a flavoured butter for fish or meat. Melted cheese. Is there anything more comforting in the world? OK, a hug from a dear one and a warm duvet perhaps. But next up is melted cheese. If in the mood for the ultimate comfort food (maybe because of a heavy night the evening before or just feeling a bit meh), I have the perfect recipe for you. This grilled cheese is exactly how I want it. Fried bread, melted cheese oozing out on the sides and a little depth from cayenne. Making something as simple as a sandwich, it’s important the ingredients are of great quality. You want a nice sourdough bread and nice cheeses. Spread one side of each slice of bread with butter. Place a large heap of grated cheddar on two of the slices, on the buttered side. Add comté and a pinch of cayenne. Place another slice of bread, buttered side down, on top so you have two sandwiches. Butter one of the outsides of each sandwich and place buttered side down in a frying pan on medium heat. Butter the other side of each sandwich and flip the sandwiches around after a few minutes. Lower the heat if needed. 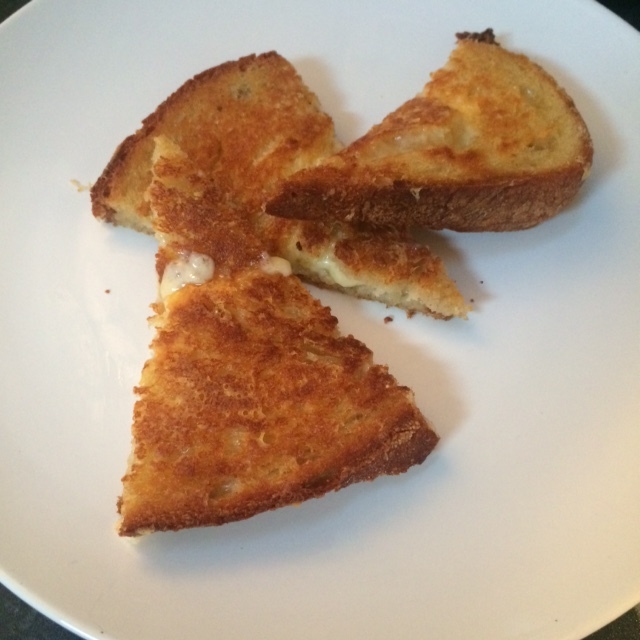 What we want to achieve is melted cheese in the middle and crispy golden bread on the outside. When done, remove the sandwiches from the pan. 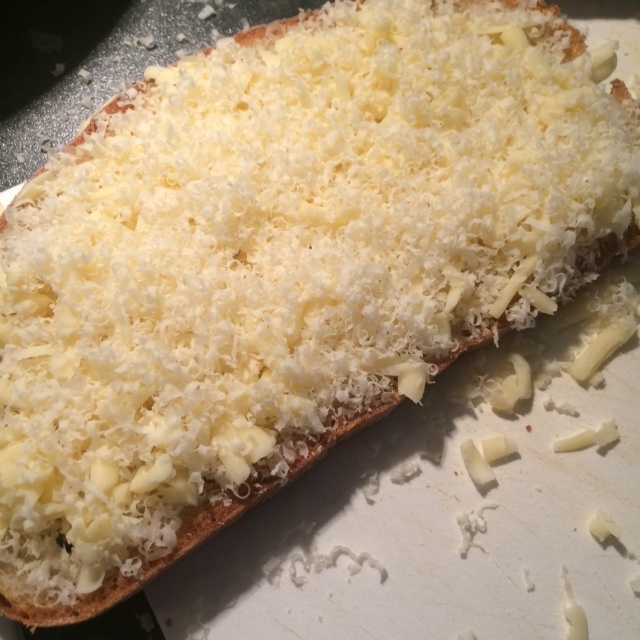 Add a layer of grated comté to the frying pan and put the sandwiches back in, creating a crispy layer of cheese on the outside of the sandwich. Repeat on the other side. Remove from the pan and cut in half (or four). Enjoy!